The Arctic Circle runs through this isolated spot north of Iceland. Forty miles north of mainland Iceland is a small island where the summer days never end and the Arctic Circle runs through it. The island of Grímsey is said to have been settled by a farmer named Grímur, who came to the island from Norway. According to legend, the island was populated by giants and trolls when Grímur arrived, and he slew them all and took the daughter of one of them as his bride. The hardiness of Grímsey fishermen is traced back to this legend. Fewer than 100 people call the five-square-kilometer island home today, but it is a popular destination for those who wish to visit the Arctic Circle. 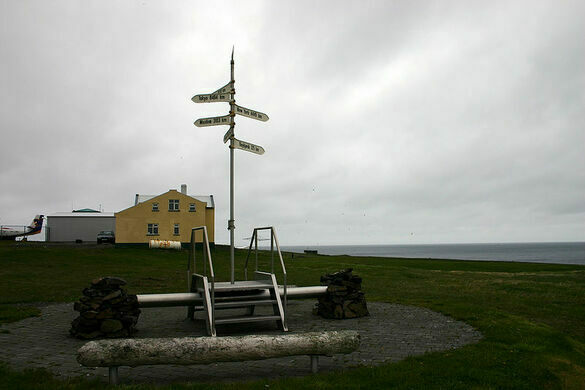 Arctic Circle visitors get a certificate commemorating their crossing, and there is a signpost saying how far major cities around the world are from that point. 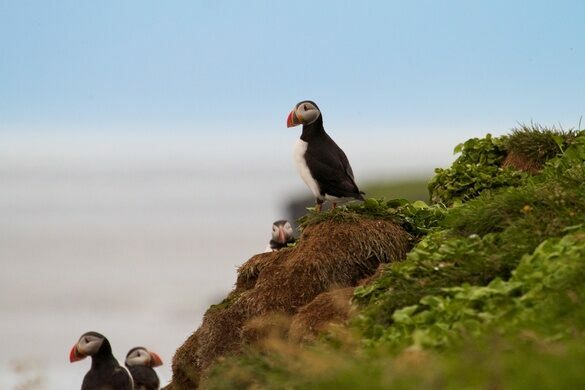 Cliffs along Grímsey’s coastline, which are home to thousands of birds, including auks and puffins, also attract tourists. Whales are often visible from these cliffs. A cave, called Prestaskvompa (Priest’s Hollow) runs under the whole length of Grímsey, and the surface of the island is mostly green, though it has no trees, only grasses, mosses, and marshland. 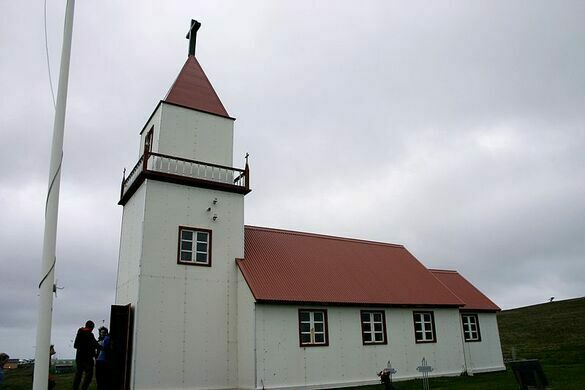 The Grímsey church was built from driftwood in 1867 and renovated in 1932. Other fascinating sites include the 1937 lighthouse, the remains of a windmill (intended as a source of electricity) built in 1973, and a monument to American chess enthusiast Daniel Willard Fiske, who became a patron of the isolated island when he learned that chess was an important part of the Grímsey lifestyle. Among his acts of patronage was to give a chess set to every Grímsey home. Fishing is the dominant industry on the island, and most of the men are involved with it. Women are, too, but with fewer than a hundred people on the island, women also have to take on most of the other roles. The local souvenir shop carries crafts made by women and a local women’s association takes care of accommodations for visitors spending one or more nights in the Community Hall. Both guesthouses on the island are also run by women. Grímsey children go to school on the island through eighth grade, after which point they continue their education in Akureyri on the mainland. A ferry makes trips to the island from the mainland throughout the week, and regular flights are also available from Air Iceland. Since some tourists only stay a few hours, planes have been known to sit and wait as long as their passengers are still enjoying the sights.